Brown Colonial Mortuary began under the direction of Harold R. Brown, who had just returned to Santa Ana after serving in Europe during World War I and subsequently working in the funeral industry in San Francisco. He joined with Samuel Harrel to form the firm of Harrell & Brown on the southeast corner of 17th and Sycamore streets in a converted residence. 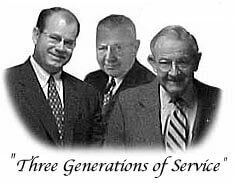 In the mid 1930’s, Mr. Harrell sold his interest to Mr. Emil Wagner. Soon the partners realized that Santa Ana was in need of a truly modern facility and the “new” Brown & Wagner Colonial Mortuary was opened in September, 1937, just across the street from the old home.